BEIJING. The pay-per-view system hasn’t been tried in the vast Chinese market but its potential as a huge sales drawer is undeniable. So far, big sports events are shown on Chinese TV free-to-air. Someone said a Manny Pacquiao fight pulls in an average audience of over 300 million across the Mainland. Pacquiao himself was flabbergasted when he was told one of his fights had a viewership of 800 million. China’s population of 1.4 billion is staggering and in this capital city, the population is 21.5 million. Can you imagine the sales of a Pacquiao fight if it were shown on pay-per-view in China? Just on sheer volume alone, it’s a can’t-miss business proposition. If each pay-per-view subscription sold for $10, with a conservative audience of 100 million, that would bring in revenues of $1 Billion. US figures would pale in comparison. In Pacquiao’s fight against Floyd Mayweather, Jr., each high-definition pop on pay-per-view sold for $100 and with subscriptions of 4.4 million, the total take amounted to $440 Million, not even half of what 100 million hits at $10 each would bring in China. So it’s no wonder that Pacquiao is excited to develop a strong partnership with the Professional Boxing Commission of China to promote the sport in the Mainland. The Chinese government actually reached out to Pacquiao even before the Jeff Horn fight in July to explore the possibility of a working relationship. Last Friday, the first joint venture between the Chinese government and Pacquiao got off to an auspicious start at the Heyuan Royal Garden Hotel grounds here with a card of nine fights before a by-invitation-only crowd of 500 guests. The Chinese organizer was Dancing Sports with the government’s Belt and Road initiative as the unifying theme. The Belt and Road effort is an ambitious program to link 60 countries in Asia, Europe and Africa through physical and digital infrastructure. Dancing Sports chairman Vincent Zhou said Belt and Road will stage a series of eight legs in an international sports festival as a platform to unify countries on a global basis. Boxing is the centerpiece sport in the Belt and Road festival. Marathon, cycling and mind games will be introduced in succeeding legs. Another boxing show is planned for December and Pacquiao’s participation will once more be tapped by the Chinese organizers. Pacquiao’s popularity in China is clearly widespread. The major Chinese sports apparel and footwear brand Anta signed up Pacquiao as a global ambassador precisely because of his reputation. And his popularity was evident in the events that he attended during a brief visit here from last Thursday to Sunday. Pacquiao went straight from the airport to preside at a press conference at the Heyuan Royal Garden Hotel last Thursday night and was warmly welcomed by his Chinese hosts and the media. Right after the press conference, Pacquiao was mobbed by officials and media who suddenly became wide-eyed fans asking for autographs and posing for photographs. It was the same thing when Pacquiao participated in a two-hour consultative forum with Chinese officials in government, business and sports the next afternoon. And at ringside for the fights last Friday, there was a never-ending stream of Chinese fans lining up for a photograph with Pacquiao or an autograph on a shirt, book, towel or any piece of paper that will be a cherished souvenir. Even the fighters on the card went over to Pacquiao after their bouts, win or lose, to pay their respects. While fights were in progress, boxers would take a quick peek at Pacquiao to check if he saw something they did right in the ring. Pacquiao said he’ll fight in China someday and his announcement was met by a burst of applause from media during the press conference. He didn’t say against whom and when it could happen but the hint was maybe, the rematch with Horn may be the attraction sometime in May next year. Apparently, Horn has resisted juicy offers to take on Pacquiao at the Philippine Arena this year only because he’s insisting to fight exclusively in Australia. There is talk that if he fights somebody else before the year ends, it could be at a stadium with a capacity of only 5,000----a far cry from the audience of over 50,000 for the Battle in Brisbane. Eventually, Horn will be lured into facing Pacquiao once more and if the stars aren’t aligned for a Manila engagement, it could go to a neutral country like China with the potential of reaching an audience of over 100 million. With China as a partner, it doesn’t make economic sense for Pacquiao to even consider Las Vegas as a future fight venue option. Boxing is a business, after all, and the sooner Horn realizes how to maximize his ring earnings, the easier it will be to formalize the rematch with Pacquiao possibly in China. 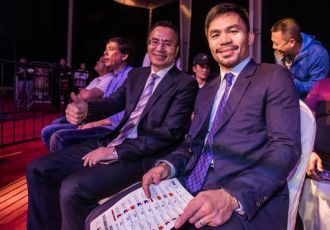 Photo: Philippine senator and boxing superstar Manny Pacquiao at ringside at a joint boxing promotion by him and his Chinese partners in Beijing last week.